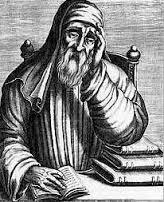 It’s been occasionally suggested that philosophers are able to talk more shite than the disciples of other less esoteric subjects. I have to say that despite having no training or expertise in this field I often quite like the shite they talk. One famous philosopher who grabbed my attention was Plutarch. One of his well known essays concerns the “Ship of Theseus”. Plutarch wondered if each piece of wood on a ship was replaced as it decayed would it remain essentially the same ship? Various minds over the years have tackled this subject and there have been very convincing arguments put forward on either side of the debate. This idea has surfaced time and time again over the centuries in different forms such as the antique dagger which has had it’s blade and handle replaced or Trigger’s broom in Only Fools and Horses. 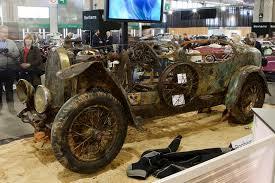 This Bugatti barnfind is worth approximately 1 squillion euro. I’d take a replica thanks. Last year Jaguar caught my (and plenty of other’s) attention when they resurrected the road going version of the D-Type. (They did have a little form here with something similar done with the E-Type back in 2014.) The history of the XKSS is very interesting and equally well documented. 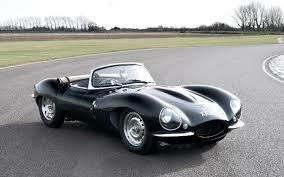 The D-Type proved asymmetrical could really be beautiful and the bits and bobs (such as a proper windscreen) added to make it street legal only improved this curvaceous little gems appearance. 25 XKSSs were pencilled in for sale and delivery to private owners. The rumour was there were 25 D-Types leftover when Jaguar retired it from racing. This would be a good way to kill two birds with one stone. Expediency aside, it seems though that sales weren’t quite what the bosses at Brown’s Lane had hoped for. Adding insult to injury the tooling and the final 9 incomplete cars were completely destroyed in a fire on the 12th February 1957. That was supposed to be that. Not so. Resurrection doesn’t come cheap though and at cool £1 million a pop the first of those nine cars is being delivered just about now. It is so faithful to the original it’s not even street legal in the UK. Truly a little slice of heaven. I don’t care who owned or drove it before. I’m with Plutarch on this one, can I have a brand new old one instead please? I was going to write and ask when a new post was going to turn up. This one shows how quickly time passes because I swear I only looked in about twenty minutes ago. Mercedes, BMW and Lamborghini have a side-business involved in utter restorations of their older cars. I haven´t been around to see their premises but I expect the “new” versions small like new cars. I also don´t care how much of the earlier car has been replaced. I would really much prefer a “brand new” W-123 than a brand-new E-class. Our good friends at Bristol got in on this act quite early and, as far as I can remember, will essentially modernise any of their previous cars meaning you get to keep the nice looks but lose the rotting wood, unreliable old motor and clapped out Reuttler seats – and you can add niceties like electric windows and air-con (no thanks to that one though). The way things are going, high-end makers mights seriously consider buying all available older cars and upcycle them on a more organised basis. I am really sure that if MB could find a way to gather W-123s and W-126s and similar period cars and refit them they´d be able to sell them at 50-70k a pop. If they wanted to keep a grip on prices why not outsource the enterprise to east Germany or even Poland where labour rates are lower? The chassis of these cars are immortal and MB has all the blue-prints. The dies are probably all still there too. Thanks for that Richard and yes time is in short supply at ATC Towers so apologies for the hiatus in posts. Can’t think of anything I’d like better than a 560 SEC straight out of the box. 30 years of service would easily be achievable and the pleasure of owning it from new easily outweighs any potential celebrity connection. I’d love to see that upcycling idea gain ground. With a critical mass it might be possible to do it even more cost effectively than you suggest. They could use the production line concept: tear down and rebuild. The painting would be the tricky part: doors off, glass out and then find the rust. It’s an interesting problem which *is* solvable. Benz, BMW and the sportscar makers are well placed to exploit the renovation market. Just checked it out. Great to see such passion for these cars. I would have loved for the promo to have talked a little more about the gorgeous coupe. That book is on the Christmas list already. Gents, with the above approach you might even get a brainless Eurobox driver such as myself to drive a proper car. 🙂 Seriously though, as everything in life becomes ever more disposable, augmented, virtual, and ‘fake’, would the attraction of a real motor create a powerful niche? Vinyl makes a comeback. Nokia relaunch an old bog standard phone. A proper car for life! Surely there’s a powerful niche there. Good point Greg. It also makes perfect sense from an environmental point of view. Recycling is what the Greens tell us we need to do. When they got into power they actually incentivised the acceleration of sales of polluting diesel cars. Surely they should be encouraging careful maintenance and upcycling of the existing fleet? Volvo 240 and Saabs up to the NG 900 are also candidates. Yes, probably anything made up to 2000 would be salvageable. Audi A8s excepted. So what about a Citroen? The CX is a candidate while the XM is marginal. I expect that if there is much of a trend to restomod cars lawmakers will step in because they won’t like “dangerous” cars being saved. I sound like Setright there, don’t I? Or worse, Daily Mail. Mick, I happened to be in Valeo in Tuam today…..it’s where they make eyes for cars! Very interesting stuff. G.
I didn’t know Valeo had a plant in Ireland. Car for life? That’s​ worth an article surely? My bid was a Bristol 411 but a Volvo 240, Saab 900 or Mercedes W-123 would suffice if you deal with the little motors. Clex, check out https://driventowrite.com/2017/01/12/what_is_the_best_car_for_a_lifetime/ . Funny you mentioned it, I had thought about doing it for ages!